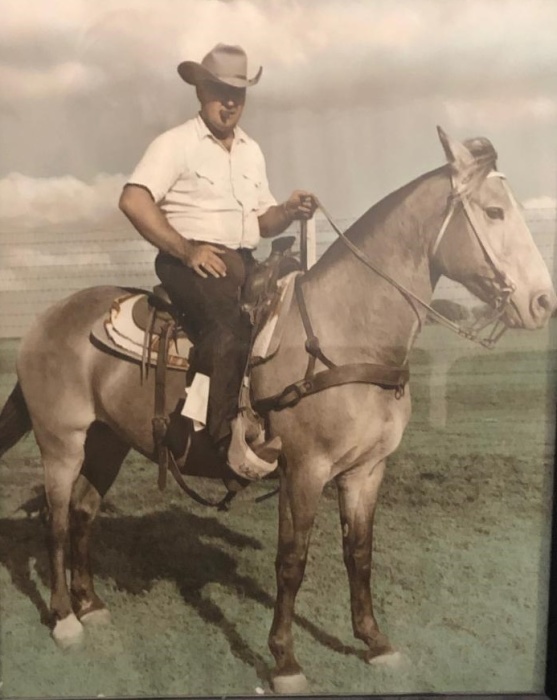 DJ Tapp, long time resident of Ponca City, Ok, passed away at his home on March 21, 2019, at the age of 83. DJ was born on the 19th of September 1935 in Ponca City, Ok. He grew up farming and ranching and that is where he learned to rope and ride. He spent many hours with his father “doctoring” cattle. He loved riding and rodeo’s, competing in bull riding, bull dogging, and team roping with is friend Buddy Griffin. He was employed by General Electric for thirty-one years. While at GE he traveled working in several countries. He was known for hosting many “Barn” party’s! From the famous G.E employee parties, that always had a live band to family reunions, DJ enjoyed seeing family and friends having a great time! While employed with GE he also had a mowing and tilling service. T & T mowing was a business he could do with his son Kevin Tapp and they formed many great memories during this time. After retiring from General Electric, he was not a man to sit still so he bought himself a dump truck and a skid loader and so began DJ Tapp Hauling. He was a hardworking man and enjoyed sharing his memories. One of his most fond memories was Coyote hunting with John Wayne and Ben Johnson. He also did much of the dirt set work for the movie Twister. He loved making the land look like a tornado had been through and talked about it often. If you knew him, you knew he had a lot of great experiences and loved to tell of them. Only the people that knew DJ intimately know what a big heart he had. DJ was known as someone who once you were blessed with his friendship, you had a lifelong friend. He is survived by his son Kevin Tapp and wife Laurie. His grandchildren Dalton Tapp, Dustin Tapp and Alissa Tapp. He is also survived by son Kyle Tapp and wife Teresa and grandson Michael Wierz and granddaughter Melanie Johns and great-grandchildren, Kylie Weirz, and Pamela Weirz, Justin Johns, and Glenn Wierz. He is proceeded in death by his father, Chester O Tapp and mother, Verna Mae Tapp, Donna L Tapp, and uncle James Tapp. Funeral services will be held on Thursday, March 28, 2019, at 2:00 p.m. at Community Christian Church, 2109 W. Grand with Rev. Justin Pickup officiating. The family will hold a private interment. In lieu of flowers, memorials should be sent to Hospice of Northern Central Oklahoma, 445 Fairview, Ponca City, OK 74601 or Ponca City Humane Society, 900 West Prospect, Ponca City, OK 74601. Our family would like to send our deepest heartfelt thanks to Hospice of North Central Oklahoma and to his care provider Joseph Valentino. Remembrances may be shared online at www.stittsworthfuneralservices.com.